Navigating NAVIC …an Indian GPS for India.. In April 2016, with the launch of it’s 7th statellite, IRNSS -1G , the Indian Regional Navigation Satellite System with the operational name NAVIC became a reality. With NAVIC (Navigation for Indian Constellation), India became one of the 5 countries to have it’s own global positioning system – like USA’s GPS, USSR’s Glassnos, Europe’s Galileo or Chines BeiDou. A variety of services will be offered by NAVIC which includes terrestrial and marine navigation, disaster management, vehicle tracking and fleet management, navigation aide for hikers and travelers, visual and voice navigation for drivers among others. In addition, it is expected to provide position accuracy of better than 20 m over Indian region and an area extending about 1500 sq km from the Indian Mainland. Why does India need an independent GPS? Not many people know that we were denied the use of GPS by USA in the Kargil war. Navigation is a fundamental capability that is needed in today’s world – we are all used to it in our daily lives with the Google MAP and various car security applications and when we order equipment via UBER or Ola! Can you imagine the operational disadvantage of an army without its positioning system? Surrounded by potentially hostile neighbors, and fast evolving as a market with its own technical prowess, it is inevitable that India would look at its own GPS. And – there are a number of feature strengths that can be brought to bear to the Indian application – that can trigger a nationwide acceptance. Accuracy, unique disaster alert capabilities by segments and several India specific features are some of the reference points for its potential positioning. There is a clear view of two segment of users for NAVIC – the Restricted Strategic User – and the standard Consumer/commercial user. The challenge is to develop a framework where NAVIC could get executed as a reality in the Indian market. As the stakeholders interacted on the roundtable – it was obvious that the technical challenge was manageable. There were industry leaders with the expertise and experience – and with proof points of actual products that were shown in the meeting. Albeit the products were at a higher cost/ unit because they had used legacy fab resolutions – but it was heartening to note that teams were having plans for a more current resolution-form factor and the issue here was more commercial than technical. Possible leverage was from the amended Motor Vehicle act, which mandates that by April 18, all public vehicles had to be equipped with GPS, GSM, Panic button and 2 digital input provision. Can India look at building a unique execution for rolling this into 2 million vehicles in the first year- and then take a cadence that makes it a defacto standard in the Indian automotive sector? 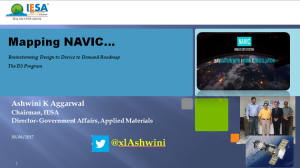 A copy of my presentation on NAVIC is shared in the download section of this blog..click the link shared here..